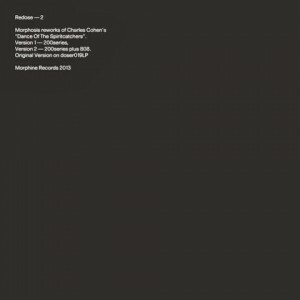 After opening doors to a number of contemporary electronic explorers, Rabih Beaini of Morphine Records has decided to uncover the works of the American musician Charles Cohen. Apart from artist’s inner circle in hometown Philadelphia there are not so many people who would exclaim oh Cohen, yes we know. The 67-year-old expert of bulky Buchla synthesizers has focused on works for stage and exhibitions but has also teamed up with hair_loss from Metasplice, the link between Cohen and Beaini. Preceding three retrospective albums out on Beaini’s label in October and November, Cohen’s first appearance on Morphine comes with two Morphosis reworks of “Dance Of The Spiritcatchers,” based on the closest relative to techno in his catalog, as The Wire put it. Beaini’s versions are pretty similar to each other. A-side’s cascading modulations construct something we can call an extended intro, being actually a beatless jam to exploit synth’s possibilities. The essence of such a pristine kosmische piece is maintained on the B-side, which is guided by warm 808 rhythms making the single a neat follow-up of the fabulous first of Redose.